Shop for "Instant Nirvana" !!! BLESSING CARVED BUDDHA, BRASS STATUE WITH BEAUTIFULL EMBROIDERED SHAWL ON A 15 INCHES BUDDHA IDOL. BUY THIS AUSPICIOUS BLESSING BUDDHA CARVED IDOL FROM OUR ONLINE SHOP, DHARAMSALA. Product no. BS019 is a finely carved, hand made Blessing Buddha Statue with a delicate brass embroidered shawl. The Statue is of the Blessing Buddha, the Supreme Healer. He holds the Blessing hand which symbolizes the nourishment of the soul. In the other hand he holds the bowl of contentment. The artist of our online shop in Dharamsala, Buddha Bazaar has exquisitely captured the radiant beauty of the Blessing Buddha. The brass statue is gold polished and embellished with an intricately carved monastic shawl. The practice of the Healing Buddha on his lotus throne is used for initiating the curative powers of the Buddha in your life. 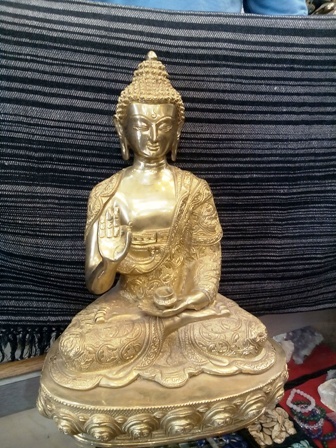 The Buddha Idol can be placed in a prayer altar in your home or in your garden from where it will radiate its healing powers for oneself and for others. The meditation of this Buddha can help you overcome the bad health and ignorance. Praying to the Blessing Buddha is considered to be extremely powerful for prosperity and purification of negative karma. It increases your power of concentration by radiating a positive flow of spiritual energy in your body. It can become the center peice of your Home or the favorite Shrine corner in your Garden party with your friends and family. It radiates its Buddha Radiance as an aura around the House.The healing of the soul through Buddhist chants accompanied by Buddhist Incense and prayer can be an important part of your life.To increase its Faith Healing power the Carved Buddha can be blessed by our team of learned monks with the insertion of the Blessing scroll on request. Enjoy this 15 inches Buddha Statue in an exclusive Buy Now offer. Height: 15 inches, Length: 08 inches. Gift included: Special Buddhist Incense. A Blessing scroll can be inserted on request in this Carved Blessing Buddha. ! How Big is my Buddha ! The length and Height of your statue has been given in Inches.